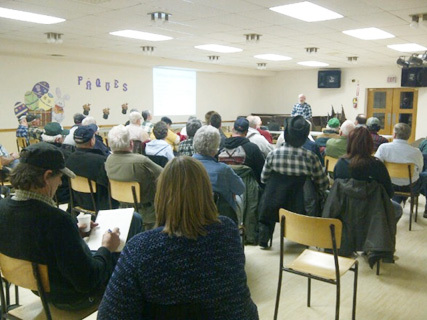 The Prescott-Russell Landowners Association (PRLA) hosted a public meeting at the South Plantagenet Hall on Thursday, March 13. Among the speakers were Tim Mount, Jean-Serge Brisson, Shirley Dolan and Tom Black from the Carleton Landowners Association (CLA). Tim Mount gave a very good presentation on “What to do when they come for you”. Based on Landowner experiences, this presentation discussed ways that people can protect themselves when a government bureaucrat comes knocking on your door. Following his talk, Tim distributed “Unwanted Visitor” cards which summarize the steps to take when the unwanted visitor is without a warrant as well as when they have a warrant. Tom Black spoke about some of the more unbelievable regulations that are being applied by provincial officials. One of them involves the moving or selling of rocks from your property. Apparently the Ministry of Natural Resources requires that property owners acquire an aggregates licence before selling rocks found on their property. Get your Land Patents folks! We haven’t found one yet where the crown retains the rights to ordinary rocks. Beth Trudeau, a Director with the PRLA, advised the audience that a rally in Ottawa would be taking place in front of Energy Minister Bob Chiarelli’s office on Friday, April 4th around noon. This rally is part of a province-wide protest that is happening in two dozen cities and towns in Ontario.